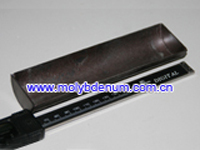 Molybdenum, namely molybenum metal is with existing forms of ores, molydate, and finished pure moly, mo alloys. Chinatungsten Online is a professional moly manufacturer and mo supplier in the past two decades, and supplied nearly all kinds of pure moly and mo alloys products, e.g. molybdenum rods, bars, electrodes, plates, sheets, foils, wire, boats, crucibles, discs, bolts, nuts, TZM alloys and so on. Molybdenum rods, moly bars, and mo block bars have outstanding electrical and heat-conducting capabilities and relatively high tensile strength. In the electrical and electronic industries, molybdenum rods are used as cathodes, cathode supports for radar devices, current leads for thorium cathodes, magnetron end hats, and mandrels for winding molybdenum filaments. Besides drawing moly wire is another important use. Moly wires include black wire with graphite surface, cleaned wire with austic cleaned surface, straightened wire, etc. Filaments used in lamps is with high temperature resistance. The wire can be thinner as 6um, thicker as 3mm, which can be packed in rolls for molybdenum material is much softer than tungsten. Mo wire furnace is applied as heating wire, whose diameter can be 6mm and 7mm. Molybdenum products are important in the missile industry, where it is used for high-temperature structural parts, such as nozzles, leading edges of control surfaces, support vanes, struts, reentry cones, heal-radiation shields, heat sinks, turbine wheels, and pumps. Molybdenum crucibles, molybdenum boats and rods have also been useful in the nuclear, chemical, glass, and metallizing industries. Service temperatures, for moly alloys in structural applications arc, is limited to a maximum of about 1650'C (3000'F). Pure mo has good resistance to hydrochloric acid and is used for acid service in chemical process industries. Moly crucibles are also widely used for growing sapphire for LED, PHONE and other industries. For the same application in sapphire growth furnace, other moly products are applied, including heat shield, wire, heater, seed chunk, and more can refer to sapphire growth furnace used Mo. In order to meet the requirement of sapphire application growing, the size of crucible has been with large size. Diameter can be processed over 500mm, and height over 1meter. 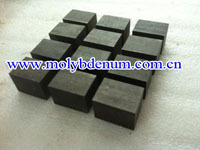 Molybdenum electrodes are one of the main molybdenum products, CTOMS has spare no effort to improve the performances. 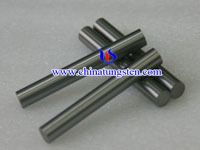 With the excellent characteristics of high strength, resistant to oxidation under high temperature, long life, well corrosion resistance and difficult to stain glass, these high pure molybdenum electrodes, molybdenum crucibles, TZM alloys have been widely used in many fields such as daily-use glass, optical glass, insulation material and glass fiber, and received good reputes, which called glass melting moly electrodes. Material from 0 .090 inches to 3 inches in thickness is classified as TZM alloys plate. 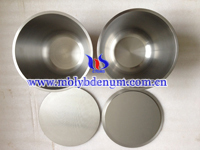 Molybdenum crucibles and TZM alloys are widely used in the construction of furnace tooling, parts and as a feed stock for the fabrication of parts for the electronics and semiconductor industries. TZM alloys (Titanium-Zirconium-Moly-Alloy) are solid-solution hardened and particle-strengthened mo based alloy. TZM alloys has a higher recrystallization temperature, higher strength, hardness and good ductility at room and elevated temperatures than unalloyed moly. In addition, TZM alloys exhibits good thermal conductivity, low vapor pressure, good corrosion resistance and is machinable. TZM alloys are approximately 250°C higher than moly and better weldability. Except TZM alloys, we have also offered other molybdenum alloys, molybdeum copper, molybdenum lanthanum, molybdenum nickel etc. TZM can be processed as moly to be disc, rod, plate, bar... As its high elastic modulus and by adding different additive, the properties of the alloys can be improved, such as higher temperature resistance. Customized molybdenum, such as standard bolt, nut, screw, or shaped moly with drawings, are all welcomed for a price quoting. We hope in our website you may find the right type(s), drawing(s) which may meet your requirement. But if you can not find what you need, you can turn to contact us directly for your requirements and/or questions. 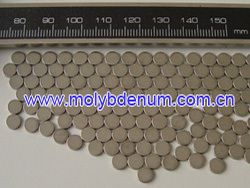 You may find the details of mo at http://en.wikipedia.org/wiki/Molybdenum. please feel free to contact us by email: sales@chinatungsten.com, sales@xiamentungsten.com or by telephone:86 592 512 9696/86 592 512 9595.